Chris: If Spencer Hawes is in as much love with The Wire as he seemed to be in this tweet yesterday, does he simply not understand what the show is about, or does he think that free market corporatist capitalism is what is missing from the West Baltimore? Does Spencer Hawes think that building a Wal-Mart and Lowe's in West Baltimore's projects is the cure-all for the blight of generations of poverty? Kirk: At some point is Hawes going to become the Atlanta head coach because some cheapskate down there says "there's really not much difference but the one letter"? Michael: Wasn't "Build a Wal-Mart and a Lowe's!" the revitalization plan for Bedford-Stuyvesant a few years ago? I think I remember seeing a panel on this at MLA a few years ago (the point of this panel was "We know that big box stores destroy communities... what this panel presupposes is... maybe they don't?). Perhaps that can go next to the Jay-Z Roc-A-Fella Izod Ray*Ban Heritage Foundation Brooklyn Nets Arena in 2014. Regardless, I've always thought of The Wire's depiction of the drug trade as the pinnacle in free market capitalism, so Spencer Hawes probably thinks of Marlo as some sort of Randian superhero, and Hamsterdam as a libertarian paradise like that alternate future Hill Valley in Back to the Future 2. I can't wait for the Nets' new arena to destroy Brooklyn. As a New Englander, there is nothing we treasure more than the degradation of other parts of the country. I say this while sipping a giant Dunkin Donuts iced coffee that has a styrofoam cup on top of the regular plastic cup. David: Hey, I live just down the street from the future site of Barclays Arena. That's my hood you are rooting for the destruction of. Chris: I'm sorry, Dave. The hammer of super gentrification must come down in Brooklyn! I feel weird about this game. In terms of the “Hamsterdam” theory of famous/hacky writers, it's hard not to root for the scrappy, yet simultaneously riveting play of Wade in the first half of this game (even as a Boston fan, he was thrilling), yet ultimately - like the drug laws of our country which the concept of “Hamsterdam” is all about exploiting holes in - the Heat's plodding pace and Wade's ultimate deference to LeBron (or higher ups in the police department, as well as political pressure, in our analogy) keep him from truly being free. Ice cold bummer! Michael: What does everyone think of Miami fans chanting "M-V-P" for all of their players, seemingly (besides Mike Bibby). In a way, it seems kind of appealing, like on a team full of stars everyone is the star. On the other hand it seems like nobody actually knows which of these players is most valuable, not even the players themselves. I mean, it very well might be Joel Anthony, in that he gives the team something they don't get from anyone else. It's definitely not Mike Bibby though. Chris: Relating back to our earlier joke subject, I feel like Spencer Hawes would hate to be on that team if mediocrity is celebrated with such vigor! I always figured that the Anthony MVP chants were sarcastic, similar to how the Celtics' home crowd always chanted for "Scalabrine" in his day, but the fans in Miami seem to be out of touch and dense enough that they probably mean it seriously. When I've watched the Heat and Celtics play during this year's playoffs, I wonder what exactly the Celtics would have to do in order to win a game or two. Stab everybody? David: Jeff Green’s doing thangs on offense, but on defense he just got sonned. And it isn't just that he's guarding LeBron, he can't get around the screen at all. Michael: Well, they chant MVP for both LeBron and Wade as well as Anthony. Maybe Bosh? I still can't figure out if Miami fans like him or not. When I was 11 I was the goalkeeper on a youth soccer team that went undefeated and didn't give up a goal the whole season. The next season they moved us up a division, but because I wasn't as athletic as the other kids and there was this younger kid who was a better goalie than me, I didn't make the 2nd division team and got stuck on a team with the dregs of our youth soccer system. I played goalie and repeatedly saw plays unfolding in front of me that I knew were going to result in goals, I'd see them as they were happening and scream at my defenders not to pressure so high, to watch the runners, to clear their lines, etc... but it'd be too late, the other team would break through and from there it was 5-0, 8-0, 11-0. I feel like that with the last 1/3 of this Celtics season. There was a moment when all the fans recognized "Oh no..." but by then it was too late. I still think they could tie this series up at 2-2, and who knows what happens from there... but it doesn't really feel like a championship team. Chris: Good point. They do seem outschooled, wakka wakka. I hate to sound bitter after last night's game, but I guess I just am disappointed to not see as much fight in a supposedly “tough” team! I really feel like LeBron pushed and shoved his way through the game and his brand of “physical play” (i.e. where everybody is too small on the other team to mess with him, and if you do, you won't get a call) is kind of horse pucky. That said, I think that if the Celtics take the two games in Boston, it will be a series, but if Miami blows out Boston or something in Game 4 (or obviously in Game 3), it's all over. That said, Wade did some astounding stuff last night, completely in admiration of his skills. I am also sort of bitter about the OKC/Memphis game not being closer last night, but what can you ask for when Eric Maynor decides to have a sort-of career night? It was at least, very interesting to watch. I know this has already been said, I don’t think the Grizzlies can win if Zach Randolph is taken out of the game? Mike Conley did the best that he could to keep them in it last night, but Perkins and Ibaka were just destorying Randolph under the basket, not allowing him to get offensive rebounds or pull out for mid-range jumpers. It was something. 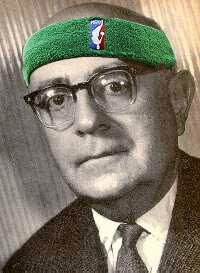 For exclusive, smart commentary on basketball and culture, check out more Negative Dunkalectics, follow @negativedunks on Twitter, and become a fan of us on Facebook. Spencer Hawes, ladies and gentlemen! I'm a libertarian who loves the wire. They aren't mutually exclusive. Thinking otherwise is kinda silly.